Product prices and availability are accurate as of 2019-02-06 02:57:18 GMT and are subject to change. Any price and availability information displayed on http://www.amazon.com/ at the time of purchase will apply to the purchase of this product. 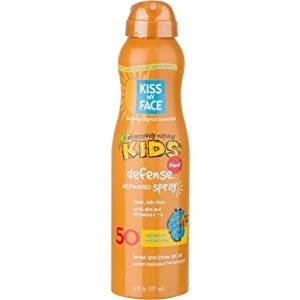 The Kiss My Face Kids' Defense Mineral SPF 50 Continuous Spray utilizes an Air Powered Spray to make sunscreening your children simpler than ever. Antioxidant Protectors like goji berries and vitamins C and E provide innovative, broad spectrum sun defense that's also friendly to sensitive skin.